Gourmet Girl Cooks: Happy Valentine's Day - Heart Shaped Ravioli-Crab-Alfredo to say I love you! Happy Valentine's Day - Heart Shaped Ravioli-Crab-Alfredo to say I love you! Well, today is Valentine's Day...and I am always such a sucker for another holiday and another excuse to make a special meal. Don't get me wrong, I do like eating out too, just not on a day when everyone else is. There is nothing romantic to me about waiting around for your "restaurant pager" to start vibrating so you can finally be seated to eat, and then another 30-45 minutes, at least, to be served your meal. Before I go any further...below, I'd like you to see what I came home to this evening...what a nice hubby I have, huh? I decided to make a special meal that wouldn't require a lot of time since it was a work night and time is a bit more scarce. Last week, I found some beautiful red and white heart shaped cheese ravioli to cook for tonight and thought it would be great served with a quick home made "light Alfredo" sauce with jumbo lump crab meat (I know, light and Alfredo shouldn't be put side by side in the same sentence....ever). In my sauce, I used some butter, milk, cream cheese, Parmesan cheese, garlic and pepper...and of course, BIG lumps of jumbo crab meat and heated it through until hot. I served our cute heart shaped raviolis with a small salad (served in little heart shaped bowls) and hot, crusty baguette bread. It was a beautiful meal that took me about 45 minutes from start to first bite. I took a few photos below. Enjoy! 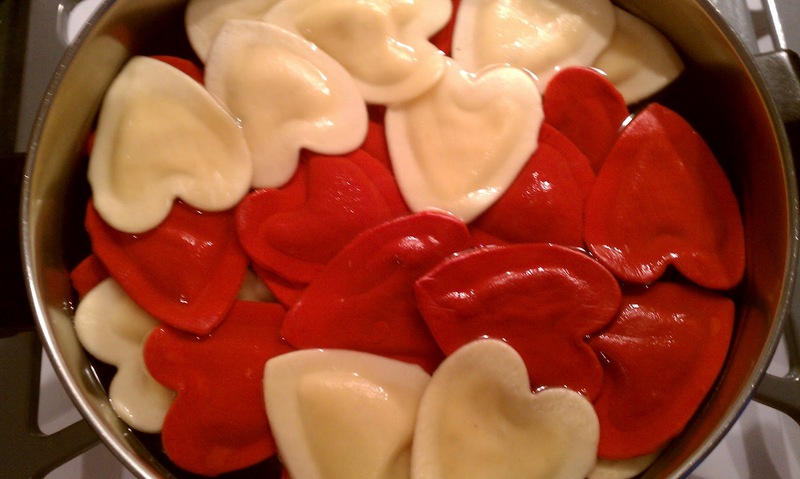 Heart shaped cheese ravioli...so pretty! Check out the jumbo lump crab meat...yum! Here is a picture of the beautiful cake my hubby brought home..."Raspberry Elegance"